The certificate was awarded in recognition of the college’s efforts in collecting nearly 5,700 pounds in electronics for the 2017 e-Scrap for Camp program, a partnership between Sunnking Electronics Recycling and Camp Good Days that turns old electronics into funds to help improve the quality of life for children, adults, and families touched by cancer. “Contributing to this program is a part of our longstanding commitment to environmental stewardship both in Western New York and around the world,” said Dr. Brenda Young, chair of the Global and Local Sustainability Program, who oversaw the college’s e-cycle collection. Overall, this year’s e-Scrap for Camp program resulted in more than 474,240 pounds of electronics collected and recycled from all participating organizations, adding to the more 2.6 million pounds recycled since the program in 2010. 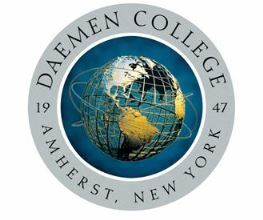 In another initiative, Daemen also hosts an annual regional Environmental Summit, which is scheduled this year for Sept. 30 and will feature highly regarded environmental experts, workshops addressing best practices and topics on a range of current issues, and an electronics recycling collection. More information is available at www.daemen.edu/summit.